"What a shame," you might say. "They have no electricity." And then you might start to feel sorry for all those trapped and unfortunate Africans who suffer from having governments that prey on their own people -- and are shut out from the light. And then you look at satellite photos of Israel and Palestine and you see that, as a result of an executive order from the Israeli neo-con junta that controls it, Gaza has just gone dark too. And then you compare the Gaza photos with satellite photos of other countries whose controllers also appear to be practicing genocide on their own people -- such as Somalia, Darfur, Burma and Tibet -- and they too have gone dark. PS: According to a friend of mine who has just returned from Gaza, "70% of Gaza's already meager electricity supplies have been stopped by Israel's blockade, which includes fuel and electricity. 50 million liters of raw sewage per day are being dumped into the Mediterranean because there is nothing to power the pumps used to process it. And the same is true with regard to Gaza's drinking water and other essential needs." PPS: Since writing this essay, I've gotten a bunch of feedback (when you write about Israel, you ALWAYS get feedback -- up to and including computer viruses, phone calls in the night and death threats!) regarding the difference between state terrorism and other kinds of terrorism. Are the Israeli neo-cons committing acts of state terrorism by turning Gaza's lights out or are they only defending Israel from the "homegrown" kind? Then Steven Moyer sent me a link to the new "Zeitgeist" addendum. Here's the link. To truly understand the difference between the two kinds of terrorism, I recommend that you watch it. 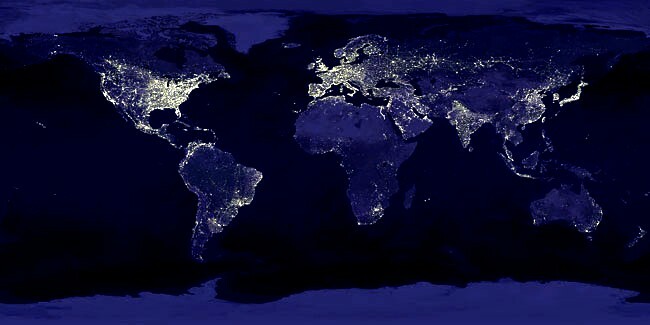 PPPS: Who cares if the lights go out in Africa or Gaza or Burma? "Will the lights be staying on in AMERICA," is the question on everyone's minds these days. Here's the answer. "Not if we keep spending over one-half of our national treasury on weapons and war and most of the rest of it on things that create carbon emissions." Twenty years from now? Our lights too are gonna be OFF.